American funny-man Will Ferrell stars opposite Gael García Bernal, Diego Luna and Genesis Rodriguez in perhaps the most unlikely of comedy line-ups you’ll see this year. 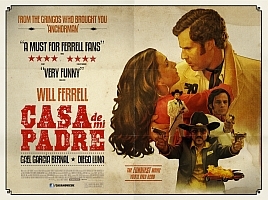 Matt Piedmont’s Casa de mi Padre (2012) is an inherently Ferrell-style comedy full of ridiculous self-deprecating humour and childish banter, but with one slight twist – the film’s almost entirely in the Spanish language. Armando Alvarez (Ferrell) is a dim-witted, hopelessly romantic rancher who dreams of finding the perfect woman with which to lie in the dirt with. He’s worked on his father’s Mexican ranch all of his life, constantly in the shadow of his overachieving brother Raul (Luna). However, when Raul arrives home with his new fiancée Sonia (Rodriguez), it seems that his lucrative international business might not be as honourable a profession as he doting father first thought. This fact is only amplified by the unwelcome appearance of Onza (Bernal), a malevolent, softly spoken and immaculately dressed drug dealer intent on taking down Raul’s empire and reclaiming Sonia. There’s no denying that Casa de mi Padre is little more than a novel idea for a sketch show skit extended to within an inch of its life (indeed, the film was written by former Saturday Night Live scriber Andrew Steele and Funny or Die co-creator Piedmont). However, whilst undeniably shallow in content and lacking in narrative diversity, there are plenty of genuine laughs to be had along the way, helping to prevent the film from succumbing to a slow and cumbersome death. The film’s parody of Mexican telenovelas relies heavily on superficial visual gags and magnifying the dated aesthetics and amateurish special effects of Mexican television. Yet it’s the novelty of seeing Ferrell perform his part completely in Spanish which is arguably Casa de mi Padre’s biggest selling point. You’d be forgiven for thinking that Ferrell may simply bumble his way through the movie with a hideously stereotypical accent, yet commendably he does a sublime job of integrating to this predominantly Mexican cast. Sadly though, this lack of prejudice and racial typecasting in his delivery of the script is in abundance throughout the rest of the film. Riddled with archaic, misogynistic portrayals of women as scantily-clad objects of desire and playing on old and often offensive stereotypes of Mexican men as being lazy, simple labourers or twitchy-eyed drug traffickers, Casa de mi Padre transcends exploitation comedy to a whole new depth of gutter comedy. Clearly aware of its outwardly-looking ignorance, the film attempts to remedy this with a few sly jokes at America. However, these gentle jabs (about their fondness for “burgers full of grease” and tendency to “buy TVs when they have no money”) barely make up for what is generally a film which relies heavily on cheap and lazy humour. Whilst this comic experiment certainly stands head and shoulders above some of Ferrell’s more mediocre projects, it still feels a million miles away from the pinnacle which was Anchorman (2004). What’s perhaps most perplexing about Casa de mi Padre is just who it’s marketed at, with the majority of Ferrell fans not renowned for celebrating the marvels of Latin American cinema. Perhaps the film could do for subtitled films what The Artist (2011) did for promoting silent cinema? More likely, however, is that it’ll result in just another barrage of numerous exaggerated tabloid stories about disgruntled cinema patrons requesting refunds.